Lecturers of Department of Physics, Faculty of Science, University of Gadjah Mada, Kuwat Triyana and Yusril Yusuf, along with other researchers joining the UGM Nanomaterial Research group that affiliates with UGM Testing Laboratory (LPPT) develop an electrospinning machine for making nanometer sized fibers or nanofiber. "The machine is used to make nanometer-sized fibers or nanofiber for a variety of purposes. 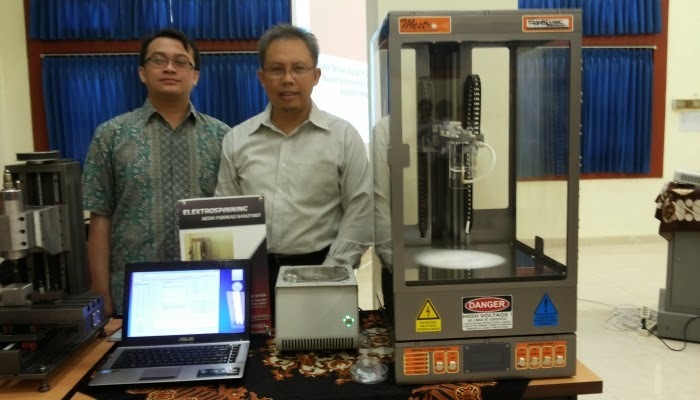 Materials to make nanofiber can be taken from abundant natural materials in Indonesia," said Kuwat Triyana in Yogyakarta on Monday, December 29, 2014. According to him, one of the materials is fishing waste like shrimp and crab shells are usually pollute the environment can be modified into chitosan hereinafter be made chitosan nanofibres. In fact, animal's skin and bones that had only become accessories such as handbags and leather shoes can be converted into a gelatin furthered made gelatin nanofiber. He said that nanofiber has properties far superior to larger sized fibers as a surface area density is very high. "That's why nanofiber to be excellent in the development of functional materials," he said. According to him, the fabrication results of nanofiber ie sheet-like fabric, but if viewed with an electron microscope looks the fibers have a diameter in tens to hundreds of nanometers. As an illustration, said Kuwat, the size of one nanometer equals one-billionth of a meter, or about one strand of hair divided by 1,000. "Its small size makes us unable to see clearly a nanofiber with the naked eye or with a regular microscope, so it must be viewed with an electron microscope," he said. He said nanofiber is now widely used in various fields. In the health sector, the nanofiber used as bandages, filters for dialysis machines, and cosmetics. As a source of renewable energy products, the nanofiber is made in the form of lithium batteries, solar cells, and fuel cell.